BREAKING: Senate Probes Complaint From FOURTH Accuser, Woman Claims 1998 Assault By Kavanaugh - Joe.My.God. The Senate Judiciary Committee is inquiring about at least one additional allegation of misconduct against Supreme Court nominee Brett Kavanaugh, according to a letter obtained by NBC News and multiple people familiar with the process. According to an anonymous complaint sent to Republican Sen. Cory Gardner of Colorado, Kavanaugh physically assaulted a woman he socialized with in the Washington, D.C., area in 1998 while he was inebriated. The sender of the complaint described an evening involving her own daughter, Kavanaugh and several friends in 1998. 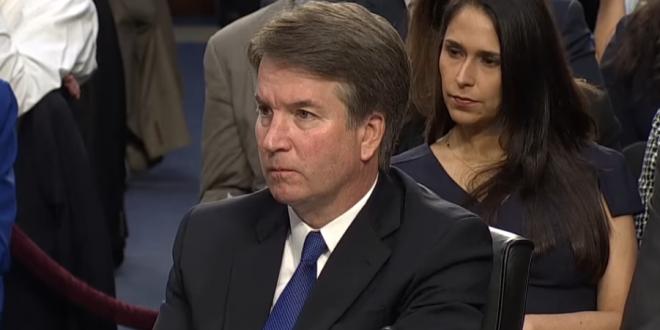 “When they left the bar (under the influence of alcohol) they were all shocked when Brett Kavanaugh, shoved her friend up against the wall very aggressively and sexually.” “There were at least four witnesses including my daughter.” The writer of the letter provided no names but said the alleged victim was still traumatized and had decided to remain anonymous herself.